Clay, a Class A PGA professional and GGA Master Instructor, carded his very first ace on the 212 yard Par 3 5th Hole at GGA’s Orlando Home, Eagle Creek Golf Club. Using a 2 hybrid, Clay couldn’t see the ball leaning in the cup until he approached the green. 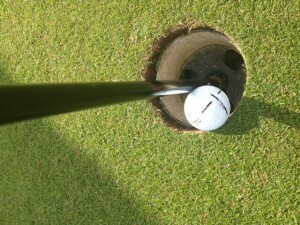 The Ace was witnessed by Tim Graves, PGA and GGA Master Instructor Dave Predzin, PGA. 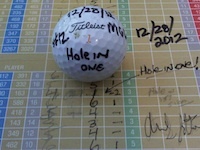 Qualification: Hole in One on December 28, 2012 at Malibu Hills Golf Club. 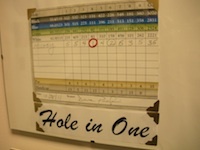 Qualification: Hole in One on June 5, 2013 at Indian Oaks Country Club in Shabbona, IL. “5 day camp in Orlando (Feb 7-12), refresher in Chicago same year. Have been playing golf for 50 yrs and never had a hole-in-one ’till now! On September 6th 2012 I was playing the 16th hole a par 3 148 yard hole and I used a 4 hybrid and didn’t see it go into the hole. I was using a yellow ball and when we got to the green there was a yellow ball on the right side of the hole. I just assumed that was mine, so I went over there but it wasn’t mine. So I was looking all over, off the green etc. until some people in the condo’s were screaming and going crazy. I asked my playing partner what they were saying and she told me they said to look in the hole. So I went to look after telling her I doubt it and there is was. This was at Colorado National Golf Club in Erie Colorado. Also June 21st 2012 I played Fossil Trace Golf course in Golden Colorado and shot a 84 which is my best score ever. course rating and slope are 71.4/133 which is the white tees. On March 21, 1999, Buz aced the Par 3 9th hole at Shadow Pines! Last month I went for a weekend golf trip to Western New York; playing Chautauqua Country Club. On a par three, approximately 175 yards long I shanked (ouch!!) a 6 iron which hit a tree and ricocheted about thirty yards behind the tee and obviously to the right. Since I was now blocked from the green I tried to cut a 4 hybrid but hit it dead straight into trees. Disgusted I re-teed (improper drop, I know) and this time I holed a 6 iron—-we called it a hole in 5 since I can only take a double bogey for handicap purposes. By the way, I have had two holes in one since using the single plane swing…one before Todd and Tim made the split from Natural Golf and the other four years ago in the USGA Senior Am qualifier.